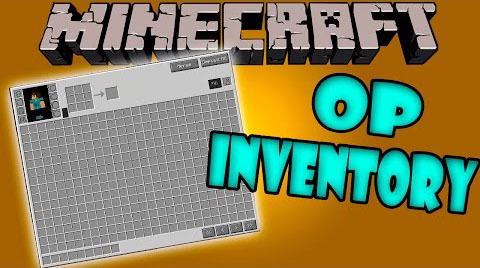 Overpowered Inventory Mod is an extraordinary mod that adds 375 inventory slots to the game and expands your inventory space to 15 rows by 25 columns = 375 total slots. Adds four special slots to hold ender pearls, ender chest, clock, and compass. A keybinding is added to use the ender pearl from this slot (regardless of what is in your hotbar). 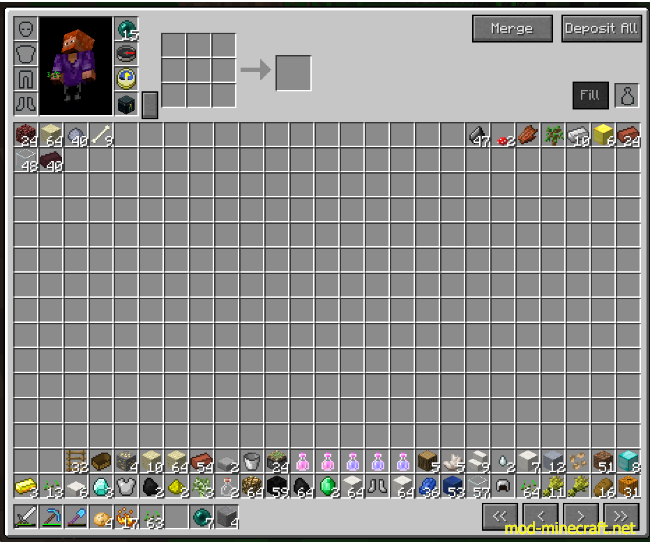 You can store experience by filling Bottles o Enchanting by putting empty bottles in a special slot in the far right. The two buttons on the top right deposit your items into nearby chests automatically. This is not a 100% lossless conversion, since Bottles o Enchanting gives randomly 3-11 exp. By default, it costs 10 exp to fill a bottle; change this in the config file. Arrow buttons cycle inventory left and right, or push them all to one corner. When a chest or other container is open, you only see the first row and a bit squished in just like the normal combined inventory. Two special buttons in the top right will deposit your items into all nearby chests all at once with a single click. “Merge” will only add to existing item stacks (for example, a chest with one cobblestone and nothing else will get that cobble filled up with 63 more, empty slots in the chest are ignored and other items are ignored). Deposit all will dump everything possible. By default this only uses chests up to 12 blocks away; this can be tweaked in the config file. It does use both trapped and regular chests, but no other containers. When opening any other vanilla container, the top right has two buttons, ?I? to go to your inventory, and ?X? to close. By default, ender pearls have been buffed to stack to 64; you can revert this in the config file to send it back to 16. Tested in SSP, SMP, with and without keepInventory gamerule. Even so, please BACK UP your worlds before installing (goes for every mod, not just this one). Using this while in CREATIVE mode will have some weird issues, the armor slots and lots of other stuff gets messed around, it is intended for SURVIVAL.